Consistent quality dryland training is essential for swimmers, triathletes, and surfers, especially for those who can’t get to a pool or the open water to train on a regular basis. 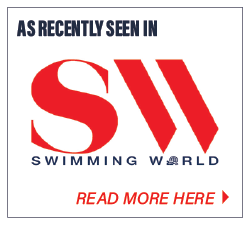 That’s one of the reasons we developed the versatile Vasa SwimErg. 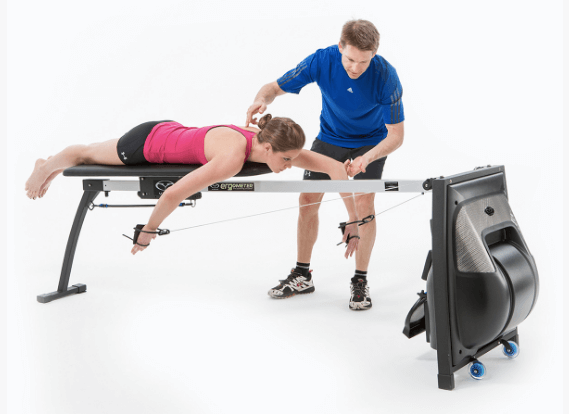 The versatile Vasa SwimErg is an exercise machine designed to improve swim-specific strength, power & endurance throughout the year while also improving technique form & efficiency. It has several features that make it useful for more than swim training, too. If you’re not familiar with the SwimErg and are curious to learn more on how it can help you, here’s what you need to know. The SwimErg is a swimming ergometer (an apparatus that measures work or energy expended during a period of physical exercise) that allows you to practice swim-specific strokes to maintain or improve your swim fitness out of the water. Training with a Vasa SwimErg gets you fully prepared to do your best when you actually swim in the pool or open water. And nothing boosts confidence better than being totally prepared! Here’s how it works. 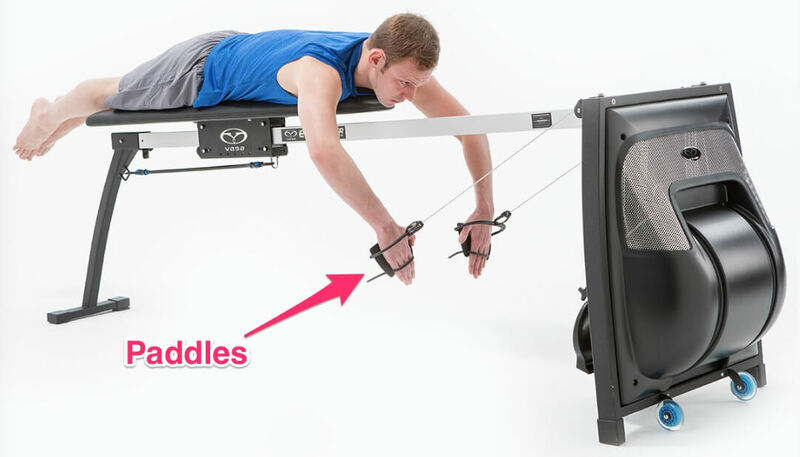 The swimmer lays prone on the anatomically designed padded bench, holds the swim paddles on the hands (shown below), and begins pulling the paddles which drive the airflow fan wheel resistance system located in the front of the machine. Hint: think of it as a rowing machine for swimming. There are 7 different resistance levels to choose from. A “closed” damper indicates a lower level of resistance. A low setting is recommended for beginners in order to build momentum, but you can adjust the levels as recommended by your swim coach. Start out using a low resistance setting (1 – 3) will allow you to first focus on learning good skills and techniques rather than building muscles without proper form. For developing strength & power, adjust the damper door to higher settings between 4 – 7, which significantly increases resistance. 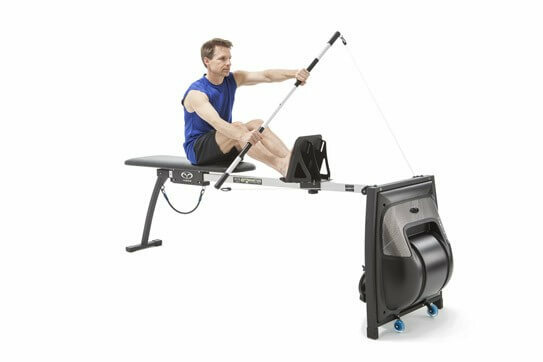 This is ideal for doing higher intensity Intervals of shorter duration. The Vasa SwimErg’s Power Meter enables you to precisely measure and record workout results so you can monitor your progress. The standard Power Meter displays elapsed time, distance, pace/100M, stroke rate, and power (Watts). Real-time feedback while training is very useful for pacing, working on aspects of the stroke such as eliminating a monospeed pull, and for bio-feedback on power output throughout the workout. The wireless ANT+ Power Meter allows you to record your training data to an external receiving device for real-time biofeedback, logging, and post-workout analysis. Data can then be saved for future reference or sent to your coach for analysis and adjustments to your training program. Watch this video to learn how to perform a basic freestyle stroke using the versatile Vasa SwimErg. We’ll also break down the steps for you in this post. Start by attaching the swim paddles or exercise handles and adjust the damper door to the appropriate resistance level (low level for beginners). If you’re using the paddles, you want to put them on before mounting the bench to ensure that they are secure on your hands. You can then step back and place your body on the bench, keeping your arms (with the paddles) in front of you. Next, lay prone on the SwimErg padded bench, head toward front and chest positioned toward the front of the bench so your legs are comfortably supported. (NOTE: people taller than 6’2″ usually find the XL bench to be more comfortable than the standard bench). From there, relax your body, keeping your legs straight out, with your arms relaxed in front of you. This will give you the best positioning to begin to perform various types of strokes. Take a look at 2012 US Olympian Alex Meyer in this video demonstrating excellent freestyle form on the SwimErg. For another perspective, watch this video as Coach Eric Neilsen demonstrates how to position yourself properly on the Vasa SwimErg. Add the Trainer Strap System (TSS) to the SwimErg and now you’ll have 2 machines in 1. This solution offers swim-specific and general resistance training options you can do using the framework of the SwimErg. For example, a simple isometric pull with both arms (using Forearm cuffs and Trainer Straps System accessories) is very effective for strengthing shoulders and engraining a correct high elbow catch, as shown in this video. 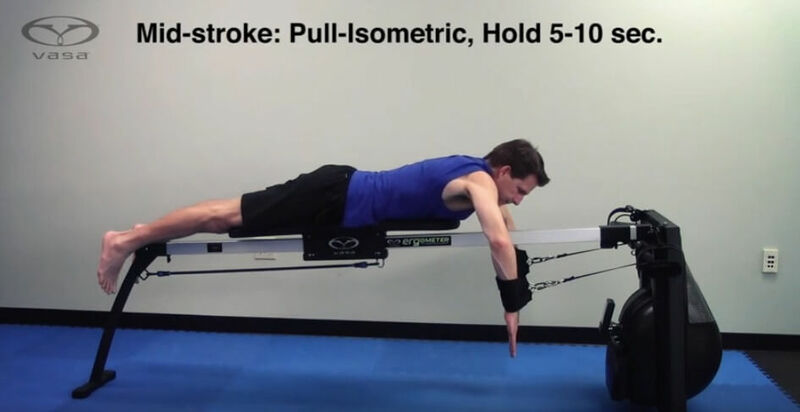 You can find more information about performing isolated SwimErg exercises (by muscle group) on our swim training resource page. You can also do a variety of functional leg exercises using the SwimErg equipped with Ankle Straps. If you or anyone in your family enjoy kayaking, SUP paddling, or just want to use the SwimErg for cross-training, use our SwimErg add-ons to increase versatility and functionality. One of the most popular accessories for the SwimErg is the Kayak Kit. This easy to use accessory gives provides a feeling and resistance levels that are very realistic to paddling a kayak on the water. The Kayak Kit lets you build endurance and practice efficient paddling technique indoors when getting on the water is not convenient. It’s very simple & quick to add or remove the foot brace and kayak paddle shaft. You sit on the padded bench, adjust the foot brace to fit your leg length, connect the paddle shaft and away you go! 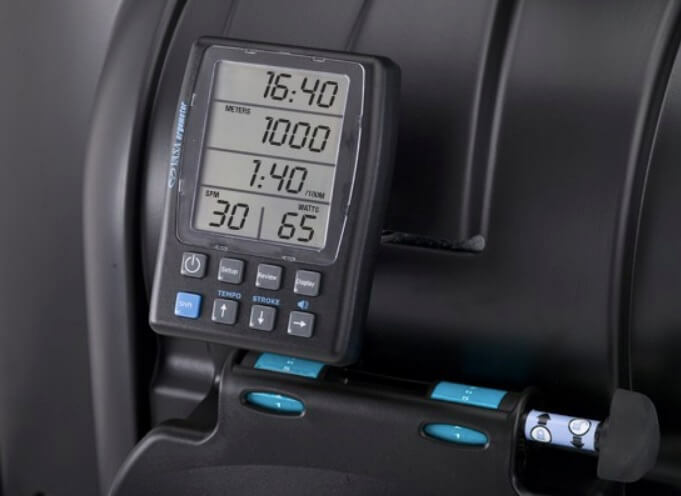 Since the Ergometer part is the same, you can vary tempo and resistance using the damper door settings. For more information on how to use the Kayak Kit, watch a kayak paddling demonstration in this video. You also find additional kayak training resources here. If you enjoy Stand Up paddling and want to maintain paddling fitness or just want the cross-training effect, the Vasa SwimErg can also be easily adapted for SUP training. Just add a SUP Paddle shaft, stand to the side of the bench & monorail, and paddle away! 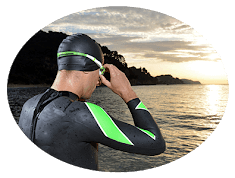 The Vasa SwimErg is a versatile and powerful training tool for helping swimmers, surfers, and triathletes to maintain quality fitness when they can’t get to the water. Not only can you use it for practicing freestyle strokes, it also allows you to perform isolated strength-building exercises as well as cross training using our add-ons like the Kayak Kit. Resistance levels are easy to adjust and a variety of accessories turn the SwimErg into a “3-in-1” functional training machine. If you are into data, get the ANT+ Power Meter for wireless tracking for all of your progress, which you can send to a coach or use to track gains in performance. With such a versatile piece of equipment, it’s simpler than ever to become a stronger, better, faster swimmer.